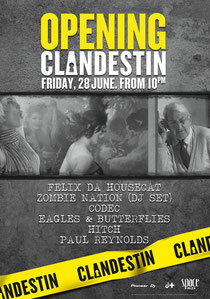 Clandestin kicks off at Space Ibiza this Friday promising a musical project for the chosen with a top line-up of DJs including its main Friday resident, Felix Da Housecat. Felix was born in Chicago, the capital of clandestine and illegal gambling dens, where back street doors were the entrances to the best parties and where underground movement lives without restrictions. This is the spirit that the night wants to recover through the Felix Da Housecat experience on the dark side of electronic music. DJs who’ll be sharing the Terrace include Tiga, BookaShade, ZombieNation, Cassius, Kraak & Smaak, Riton, SanSoda, A-Trak, Bondax, Brondinsky, JesseRose, KrysalKlear, MonkeySafari, ErolAlkan and many more.From 10pm, the music in Sunset Terrace will feature Paul Reynolds and the resident DJ for the entire season, Hitch. It all kicks off at 10pm tomorrow, Friday June 28, through to September 20.